So the Review continues along the trajectory toward greater engagement with substantive material, mostly critiquing the critics, and is spending less time producing short reviews of books which would soon be forgotten anyway. I would not quite say the Review has hit it’s stride with this issue—were still a few years away from what I would consider the “hey day” of the Review—but it’s getting there. Daniel C. Peterson, “Editor’s Introduction: Of Implications,” pg. v–xiii: A relatively short, and pretty lighthearted and fun bit of satire skewering a couple of especially bad anti-Mormon arguments. One argument he responds to is pretty idiosyncratic, but the other is the issue of whether Mormons are Christians. Peterson points out that members of a class need not have all things in common to be in the same classification, just as not all reptiles have the same features. Read if you want to have a good laugh. Also, for what it’s worth, I do believe this is the first issue where Dan Peterson offered his “editor’s picks,” recommending some of the publications under review, so that is a new feature. Camille S. Williams, review of The Easy-to-Read Book of Mormon, by Lynn Matthews Anderson, and Mormon’s Story, by Timothy B. Wilson, pg. 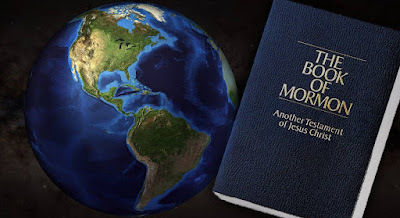 3–12: As we get further and further from the translation culture of the Book of Mormon, and as more and more other Christians move away from the KJV Bible for more contemporary translations (or, alternatively, more and more people simply do not grow up reading the Bible at all), the need for getting the message of the Book of Mormon across in a way that is easier for people to understand increases. Yet, the Church has expressed concern over individual members editing and “dumbing down” the Book of Mormon, and I think Williams articulates some legitimate reasons for the concern. While the need will not go away, any effort to help make the Book of Mormon understandable should be aware of and try to navigate concerns like those explained by Williams. John Gee, “Abracadabra, Isaac, and Jacob,” a review of Edward H. Ashment, The Use of Egyptian Magical Papyri to Authenticate the Book of Abraham: A Critical Review (Salt Lake City: resource Communications, 1993), pg. 19–84: In 1991–92, Gee published two short notices (one in Insights and one the Ensign), on Egyptian Papyri which talked about Abraham, one of which included a lion couch scene (the genre that Fac. 1 falls into), and another that potentially ties Abraham to the hypocephalus (as the wedjet-eye; the genre Fac. 2 falls into). Ashment (and the Tanners) responded to these, and this is Gee’s rebuttal. Gee provides important clarifications of the argument’s purpose (not to prove the Book of Abraham). Gee also discusses the origins of the papyri collection in question, providing lots of important background. He also argues that they are Egyptian, not Greek (as was the common position at the time; since then, I believe the scholars have largely come to agree that the papyri are Egyptian). Gee also provides an extensive discussion on the use of the word “magic” in scholarly discourse. He also dissects Ashment’s idiosyncratic argument that Abraham’s name did not appear on the papyri (a view undisputed among Egyptologists). This is must read material on the Book of Abraham and the Joseph Smith Papyri. Ross David Baron, “Melodie Moench Charles and the Humanist Worldview,” review of Melodie Moench Charles, “Book of Mormon Christology,” in New Approaches to the Book of Mormon: Explorations in Critical Methodology, ed. Brent Lee Metcalfe (Salt Lake City, UT: Signature Books, 1993), 81–114, pg. 91–119: Baron offers additional response to Melodie Charles’s contribution to New Approaches. Baron starts by pointing out that it does not actually discuss Christology, but instead offers what he sees as a superficial proof-texting designed to make it seem like the Book of Mormon reflects Joseph Smith’s early views on the Godhead. He briefly points out that there are lots of errors in her footnotes, and also that her interpretation of Mosiah 15:1–4 is at odds with numerous commentators on the subject. Baron outlines the four major arguments of Charles, and then goes on to discuss each in turn. Baron argues that there are other clear, centuries-before-the-fact prophecies of Christ, and that objection to such ultimately boils down whether one accepts that prophecy is real or not. Baron draws on Margeret Barker (the earliest such of Barker by an LDS scholar, I think) to argue that the Messianic ideas in the Book of Mormon are not anachronistic, as Charles argues, but are consistent with pre-Christian Jewish thought. Baron also discusses the supposed contradictions between the Book of Mormon’s Christology and LDS Christology, and Jehovah as Christ. 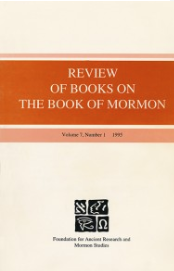 Gary F. Novak, “Examining the Environmental Explanation of the Book of Mormon,” a review of Robert N. Hullinger, Joseph Smith’s Response to Skepticism (Salt Lake City, Utah: Signature Books, 1992), pg. 139–154: Novak compares this Signature edition to the originally published version of Hullinger’s book and notes the deceptive ways in which it has been edited to seem more “neutral” in this edition. Novak then notes some methodological issues—namely Hullinger’s dependence on his own assumptions about Joseph Smith’s motives. Novak then examines the way Hullinger interprets the Book of Mormon, finding that his interpretations are often problematic. Novak then critically examines the narrative Hullinger tries to craft. The best part of this review, however, is at the very end, where Novak offers an “environmental explanation” of the “environmental explanation of the Book of Mormon.” Wherein Novak amusingly parodies environmental explanations about the Book of Mormon to explain why ex-Mormon historians write such studies of the Book of Mormon/Joseph Smith, with the ultimate purpose being to make a point about such arguments. Well worth the read. LeIsle Jacobson, “Review of Questions to Ask Your Mormon Friend: Effective Ways to Challenge a Mormon’s Arguments without Being Offensive, by Bill McKeever and Eric Johnson,” pg. 155–169: Jacobson illustrates how McKeever and Johnson utterly fail at their own stated aims, and this is yet another standard anti-Mormon book which promises much but delivers very little. Some useful arguments for dealing with some standard claims of Evangelical anti-Mormonism. Alan Goff, “Uncritical Theory and Thin Description: The Resistance to History,” a review of Brent Lee Metcalfe, “Apologetic and Critical Assumptions about Book of Mormon Historicity,” Dialogue 26/3 (Fall 1993): 153-184, pg. 170–207: As is Goff’s typical modus operandi, Goff goes cuts right into the ideological foundations of Metcalfe’s arguments, shows that Metcalfe is in fact a positivist. Goff reviews Metcalf’s discussion of literary and narrative theory and shows how these actually undercut Metcalf’s arguments. He reviews positivism in Mormon historical writing and the tendency, manifest by Metcalfe, to redefine positivism in a way that excludes themselves. Goff stresses that all writing is ideological, including that of Metcalfe’s (and that the claim to be ideologically free is a positivist assertion). Goff also discusses how history writing and literature writing are not mutually exclusive categories, and in fact history writing can often be literary. Goff then begins to discuss the Book of Mormon. He talks about narrative repetitions and intertexuality, and allusion, and then applies this to narratives involving King Noah to show the complex sophistication of the text. Goff argues that acknowledging the sophistication of the text and holding it to be a modern book produced by Joseph Smith is untenable. Louis Midgley, “Atheists and Cultural Mormons Promote Naturalistic Humanism,” a review of George D. Smith, ed., Religion, Feminism, and Freedom of Conscience: A Mormon/Humanist Dialogue (Salt Lake City, Utah: Signature Books, 1994), pg. 229–297: In his familiar style, Midgley outlines the ideological underpinnings of the various contributors to this volume, showing that there is no real exchange of ideas, or “dialogue” between Mormonism and humanism because the various Mormons who participated were merely cultural Mormons who had themselves adopted a brand of secular humanism, though perhaps cloaked in LDS language. Midgley discusses what is at stake for the Saints if they adopt such an ideology, and exposes much of the material in the volume as little more than ideological propaganda. He notes that the contributors themselves seem unwilling to confront the stakes he outlines, but quotes extensively from Sterling McMurrin, a Mormon humanist who was quite candid about the ideology’s incompatibility with the restored gospel as traditionally understood. Throughout the review, I was impressed at how relevant each of the topics Midgely discussed were to current conversations about dissidents and dissent in the LDS faith. 20 years later, these are still the same conflicts and issues we see arise among those who wish to “change” the Church. William J. Hamblin, “The Return of Simon and Helena,” a review of Paul Toscano, The Sanctity of Dissent (Salt Lake City, Utah: Signature Books, 1994), pg. 298–316: Toscano’s own brand of “Mormonism” is so idiosyncratic that it is hard to see it being directly relevant to the current issues of dissent today. And yet, in very important respects, it is. Paul and his wife Margaret advocated for the ordination of women, and Margaret was (based on some reports) involved in Ordain Women (albeit somewhat behind the scenes). What’s more, Hamblin hits on many of the same general themes related to dissent, including a great discussion of freedom of speech and thought and the Church. Having actually read this issue 4 years ago, it’s hard to say what is and is not “must read” material. I know that John Gee’s review of Ashment is certainly still must read on the Book of Abraham. Novak has some great remarks about the importance of Book of Mormon historicity that are worthwhile, and his “environmental explanation of environmental explanations” is great for the way it exposes methodological and ideological problems with naturalistic explanations of the Book of Mormon. But I am not sure the overall essay is “must read” stuff. Goff is also always very much worthwhile, but I’d have to go over it again before deciding if it’s must read, and I just don’t have the time right now. Ditto on the Midgley review. Overall the rating (which I decided right after reading this issue, and not just now) suggests to me that I didn’t think much was “must read” material in this issue. So while there was less fluff, there was not as much truly memorable material in this issue either. But I will say this: in glancing back over my notes and some of the reviews in this issue, I am again struck (as I have been in the past with other issues) as just how relevant some of these 20+ years old discussions remain today. As such, I think there is a great deal of value in going through these older essays, if for no other reason than for better understanding how our conversations got to where they are today.